Response: The current breast cancer screening recommendations in the United States are unclear regarding when to stop screening. Several societies with published recommendations conflict in regard to when to discontinue screeningmammography. 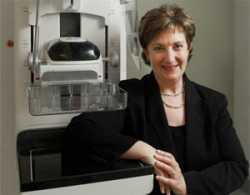 There is little evidence studying the benefit of annual mammography in the population of women 75 and older. Due to this, we felt that it was a very important and timely topic to investigate, with the goal of providing further guidance on why screening mammography may be beneficial in this older population. Dr. Solveig Hofvind, Dr. Philos. Response: To test out Digital Breast Tomosynthesis (DBT) in combination with synthethic images (SM) as a screening tool for breast cancer. We screened the women in Oslo with DBT+SM using equipment from Hologic, while women in the neighboring counties were screened with Digital Mammography. Both the rate of invasive breast cancer and ductal carcinoma in situ was higher. Tumors detected with DBT+SM were smaller and less aggressive compared to those detected with Digital Mammography. We found no differences in recall rates between the two groups. Response: Screening with Digital Breast Tomosynthesis and Synthetic 2D Mammography detects more breast cancer as Digital Mammography. Response: We need to follow the women for interval breast cancer, but also the rate of screen-detected breast cancer and the characteristics of the tumors in the next screening round. Response: The pro and cons of implementing Digital Breast Tomosynthesis and Synthetic 2D Mammography in a screening setting need further investigation, according to cost-effectiveness, also in a financial perspective. Digital Breast Tomosynthesis and Synthetic 2D Mammography versus Digital Mammography: Evaluation in a Population-based Screening Program. Hofvind S1, Hovda T1, Holen ÅS1, Lee CI1, Albertsen J1, Bjørndal H1, Brandal SHB1, Gullien R1, Lømo J1, Park D1, Romundstad L1, Suhrke P1, Vigeland E1, Skaane P1. Dr. Lee: Even before the USPSTF changed their breast screening guidelines in 2009, I conducted community outreach to help educate others on my area of expertise, breast imaging and breast screening. I presented lay friendly, illustrated, and practical explanations in a structured talk, about the big picture and the salient details, in a way that I would want if I were not a breast radiologist. As is customary for such community outreach, we solicited feedback from attendees. It was gratifying to hear the positive responses. That they wished for such education for others served as a clarion call that is understandable. Education should be objective and noncoercive. “Knowledge is power,” but only if complete and accurate. Breast cancer is still a common disease, we are all at least at average risk, and screening is still standard of care. Much of the debate surrounding screening mammography centers on the age of onset of screening and the optimal screening interval. The USPSTF states that shared-decision making between women and their providers may occur, especially for women in 40-49 year group. But the TF does not stipulate when or how or by whom this talk will ensue, and notice that their guidelines refer to film mammography, and “biennial” mammography. Since the time of this manuscript, the American Cancer Society issued new guidelines on 10/20/2015 that among its bullet points emphasized annual mammography for women 45-54 years and deemphasized clinical breast exam, while supporting option to start annually at age 40 with shared decision making to weigh what are referred to as “risks” and benefits. Although the fine print does reaffirm that annually starting at age 40 is the screening model that saves the most lives, the ACS is encouraging deliberate value judgment regarding “risks” and “harms.” Their fine print is also intimating that women 55 and over have nondense tissue and that their cancers are indolent. The ensued publicity and mixed messaging have caused another cycle of confusion regarding breast cancer screening. As the experts in this field of image-based screening, radiologists have opportunity to clarify and contextualize the issues and details of the screening discussion, and can do so with objectivity, respect for all sides of the debate, and compassion. All responsible ways to continually educate both women and all providers will enable both sides to engage in the discussion fairly. Because as we discourage paternalistic medicine and promote shared decision making, it’s not fair play if all responsible sides do not get fair say. Do realize that not all women see providers regularly, and depending on the medical subspeciality, not all providers are mentioning screening til women reach a certain age and may not relay importance of the physical exam components that complement imaging. This article specifically highlights how such direct and interactive public education can effect potential benefit in two ways. First, directly reduce one of the core criticisms about screening: the “anxiety” that women may experience, which is heavily weighed as a “harm” of screening. Most women do not experience high anxiety, and are glad to have a test that may help them. And education can help demystify much of the process and protocol, and explain up to what may be that patient’s next test results if she engages in screening at all. No one can tell that. Two, education can directly increase one of the necessary components of shared decision making that is presumed in implementing breast screening: informing women. The pre- and post-lecture questionnaire, along with fact-based quiz questions, provided insight and enabled learning opportunity for the audience that are not usual for community outreach. Education that keeps on going—and is shareable!– after the lecture is done. Dr. Heleno: False positive mammography causes psychological distress. Several observational studies have shown this, and their results have been summarized in systematic reviews. However, it was unclear whether women requiring invasive tests (needle or surgical biopsy) were more distressed than women only requiring non-invasive procedures (clinical examination or imaging). Contrary to previous research, we found that these two groups of women were equally distressed during the 36 months of follow-up in our cohort. The best estimate for the difference for 12 related measures of distress was always close to zero. Dr. Vacek: Clinical trials to evaluate the effectiveness of screening mammography have focused primarily on women under age 70 and, consequently, its benefit for older women is uncertain. However, many believe that the benefit of screening mammography diminishes as women age and acquire other health problems, because they are less likely to live long enough for any detected breast cancer to have a clinical impact. To gain insight into this, we followed approximately 20,000 women aged 70 and older for an average of 10 years to examine their mammography use, cancer detection and survival. We found that screening mammography use declined steadily (9% per year) after age 70, but this was not accompanied by decline in the incidence of invasive breast cancer. Hence, as the women aged breast cancer was more likely to be detected clinically than by screening. The clinically detected tumors were significantly larger and of more advance stage and were associated with poorer overall survival, for all but the oldest and most infirm women. We also found that the use of breast conserving surgery as the only treatment for early stage cancer increased markedly with age and was associated with shorter survival compared to women receiving radiation or mastectomy. MedicalResearch.com What are the main findings of the study? Dr. Lourenco: Our study found a significantly higher recall rate for screening mammography at a tertiary referral hospital compared with a community private practice. We compared recall rates for 5 fellowship trained radiologists reading at both sites, and all five radiologists had higher recall rates at the hospital site. When we analyzed patient factors in an effort to explain why this might be, we found that the average age of patients in the hospital was younger (which is known to be associated with higher recall rate) and that more patients at the hospital had a personal history of prior breast biopsy or surgery (also known to be associated with higher recall rate). More immigrant women are getting mammograms now than a decade ago. Fewer immigrant women receive mammograms than native-born American women, according to Penn State researchers, who note that more immigrant women are getting mammograms now than a decade ago. “Lack of access to health care persistently contributes to mammography screening disparities among immigrants,” said Nengliang Aaron Yao, graduate student in health policy and administration. Yao, working with Marianne Hillemeier, associate professor of health policy and administration, reviewed data on women over 40 who received mammograms in the United States from the years 2000 and 2008. He reported these statistics to attendees at the American Association for Cancer Research conference on the Science of Cancer Health Disparities in Racial/Ethnic Minorities and the Medically Underserved today (Sept. 19) in Washington, D.C. The data came from the National Health Interview Survey. “More recent immigrants, those with poor access to health care, and those who were younger and less educated had lower mammography rates at both time points,” said Yao. Yao found the number of immigrant women who received mammograms rose by almost 10 percent from 2000 to 2008. While the percentage of immigrant women receiving mammograms is less than U.S.-born women, the gap has shrunk. In 2000, the gap between immigrants and U.S.-born women was 11.2 percent, while in 2008 the gap was only 3.4 percent. In 2000 60.2 percent of immigrant women over 40 received mammograms while in 2008, 65.5 percent received them.